Last year around this time we brought word of the Drinks by the Dram Whisky Advent Calendars. What started off 5 years ago as a one-off calendar (which I badly wanted at the time, and still do) had grown into a whole range, including a £999 "Old & Rare" calendar. The range has clearly been well-received over the years, as it's back again for 2016, with a whopping 25 calendars, including the "Very Old & Rare Whisky Advent Calendar" for the princely sum of £9,999.95 (side note: if you live outside the UK, it's only £8333.29)! The full range can be found here, but you might be curious as to what sort of samples you can find in an (almost) £10,000 calendar. ...unfortunately, Drinks by the Dram haven't yet published the full list of drams, but one look at the press shot (below) tells us we can expect Glenfiddich 40yo (which we tasted all the way back in 2012, funnily enough on Christmas Eve) and Port Ellen 5th Release, which should tell us something about the level of drams. Apparently one of the drams is from a full bottle worth £19,000. Glenfarclas 60 Year Old, Ladyburn 40 Year Old 1974 (cask 74), Private Cask Collection (William Grant & Sons), Karuizawa 48 Year Old 1964 (cask 3603), Balvenie 46 Year Old 1968 (cask 7293), The Balvenie DCS Compendium Chapter One, Yamazaki Age Unknown, Keizo Saji, The Last Drop 50 Year Old Double Matured, Port Ellen 25 Year Old 1979 - 5th Release (2005 Special Release), The John Walker, Port Askaig 45 Year Old, Glenfiddich 40 Year Old Limited Edition, The Balvenie 40 Year Old, The Macallan M, Highland Park 40 Year Old, The Golden Age Blend, Teeling 33 Year Old, Glengoyne 35 Year Old, Auchentoshan 44 Year Old 1966, The Half-Century Blend, The Macallan 42 Year Old 1969 (cask 6860) - The Rarest of the Rare Collection (Duncan Taylor), Pappy Van Winkle's 23 Year Old Family Reserve, Karuizawa 1984 Cask 4021 - Koi, The Glenrothes 1969 (cask 11485), The Dalmore Constellation 1981 - 30 Year Old, Tomatin 1971 44 Year Old. Does the value of the 24 samples add up to £10k? Quite possibly not. Will people who buy it care? Pretty sure they won't! 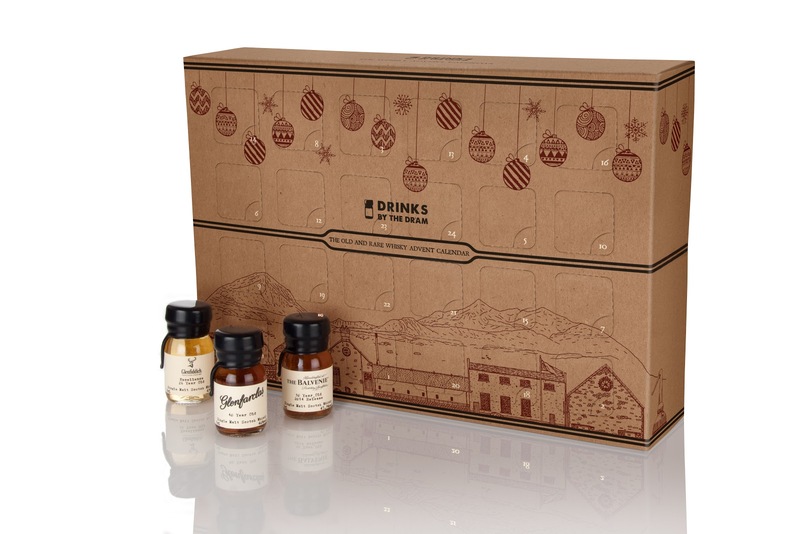 "For the fifth year running, the range of Drinks by the Dram Advent Calendars has returned. The selection once again features classics like Whisky, Ginvent and Rum, while exciting new additions include calendars dedicated to Scotch, American, Irish and Japanese whiskies along with calendars full of Glenfarclas Single Malt, independent whisky bottlings from That Boutique-y Whisky Company and Origin Single Estate Gins made with juniper sourced from specific regions all around the world. The Whisky Advent Calendar was launched in 2012, and has since become a tradition among whisky enthusiasts, letting them count down to Christmas and explore the world’s best whiskies. Each handmade, wax-sealed dram allows whisky fans to sample a new expression, tasting everything from single grain and bourbon to rare Scotch worth up to £600 a bottle. 2016 marks the debut of the Drinks by the Dram Very Old & Rare Whisky Advent Calendar (RRP £9,999.95), developing on the concept introduced by the Old & Rare Advent Calendar launched in 2015. Each calendar is a bespoke wooden box built by hand by cabinet-maker Simon Jewell Designs in Kent, and is available in a walnut or macassar ebony finish. Within every calendar sit 24 individually numbered 30ml drams of some of the world’s most sought-after whiskies, including expressions from long-closed distilleries, a 60 year old single malt and a whisky worth up to £19,000 a bottle. Drinks by the Dram’s 2016 Advent Calendar range also includes calendars filled with single cask whiskies, mezcal, gin and more. The full range of calendars (listed below) will be available later this month. Naga Chilli Vodka Escalation Advent Calendar"
On the slightly more affordable end of the spectrum, the "Scotch Whisky Advent Calendar" appears to include Glenfiddich 18 (tasted here), Talisker Skye and "The Half Century Blend", for £149, whilst the "Old & Rare" (still £999) looks to include Balvenie 30 (tasted here), Glenfarclas 40 (tasted here) and Glenfiddich Excellence 26. 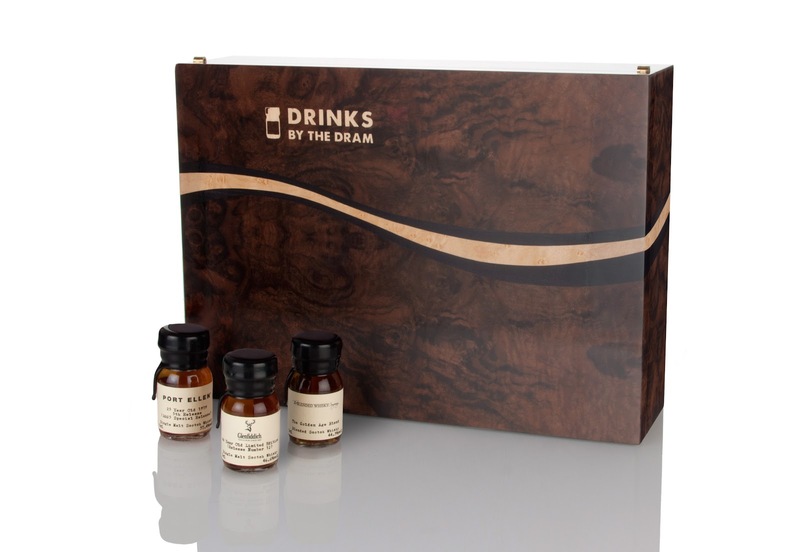 Drinks by the Dram Whisky Advent Calendars are available for pre-order here now. If only postage to Australia wasn't a whopping $70 on top of the $200 advent calendar. Cool blog by the way!